Age 68, of Southfield, died July 7th. 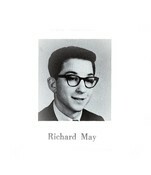 A special education teacher for 30 years, Rick May, in 1994, founded RICK MAY'S ALL STAR CAMP, a nonprofit summer camp for adults with special needs to continue their emotional and physical growth under the direction of trained staff. Located at Lamphere Center in Madison Heights, the staff is comprised of school teachers, retired teachers, para-professionals, music therapists, certified exercise instructors, Detroit Opera House instructors, the camp is open to adults starting at age 17. Weekly activities include art class, field trips, games, movies, music, dance, exercise, special guests, special lunch days and more. As a musician, his family agrees that Rick played the trumpet like an angel. He played the shofar at Congregation Shir Tikvah and was recorded so that shut-ins could hear the shofar during the holy days. He played a variety of music but for the last ten years, spent most of his time with Kleizmer music and started the "Schmaltz Kleizmer Band" which played at assisted living facilities, Bar and Bat Mitzvahs, weddings and retirement homes. An active member and volunteer at Congregation Shir Tikvah, he taught Jewish Music classes, played once a month at a Musical Shabbat Service, assisted with S.O.S. the South Oakland Shelter where Congregation Shir Tikvah opened its doors as a homeless shelter for needy individuals and families. He also helped with special needs children at the congregation's school and always "Showed Up" when the congregation needed volunteers. Rick as also an avid bike rider, and loved to tinker with cars. The family has requested that condolence visits begin at 4:00 PM each day. When: 7:00 PM Monday, Tuesday and Wednesday. Beloved husband for 47 years to Joyce May. Devoted father of Kenneth May, Scott May, Amanda May, Tana (Chris) Brozik and Andrew May. Proud grandfather of Maura, Aliyah, Alexzander, Brianna and Chloe May. Loving son of Sylvia May and the late Joseph May. Cherished brother of Marcia (Harley) Adler, Ira May and Michelle (David Walt) May-Walt. also survived by loving nieces, nephews, other relatives and devoted friends.